Marilyn Virginia Thompson Flora, 87, formerly of Laketon, died at 2:50 pm, Thursday, Feb. 15, 2018, at Sycamore Village Healthcare Center in Fort Wayne. 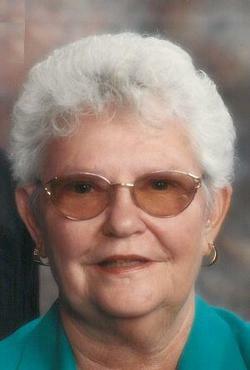 She was born Oct. 21, 1930, in Wabash to Milton and Mabel (Renicker) Brubaker. She was a 1948 graduate of Laketon High School. She first married Fred Allen Thompson in North Manchester on June 24, 1950. He died Nov. 3, 2007. She then married Dale Flora on Nov. 26, 2011. She worked for the US Postal Service 30 years, and the last 11 years as postmaster at the Laketon Post Office, retiring in 1990. She was a member of the Ijamesville United Methodist Church, member and past president of the Laketon American Legion Auxiliary, and a volunteer for CHEER and the North Manchester Library. She is survived by her husband, Dale Flora of North Manchester; two sons: Fred (Debbie) Thompson and Terry (Vickie) Thompson, both of North Manchester; three step-sons: Mike (Marsha) Flora of Fort Wayne, Tom Flora of LaGrange, and Dan (Teresa) Flora of North Manchester; five grandchildren: Jarrod (Jane) Thompson of Lansing, Mich., Shilo Perlman of Boca Raton, Fla., Briana (Gary) McCarary of Cincinnati, Lucas Thompson of North Manchester and Travis (Kristie) Thompson of West Chester, Ohio; three great-granddaughters: Savannah Thompson of Lansing, Mich., Emmalynn Thompson and Elliana Thompson of West Chester, Ohio; and eight step granddaughters. She was also preceded in death by her parents and two brothers. Funeral services will be 2 p.m. Monday at Grandstaff-Hentgen Bender Chapel, North Manchester, with Pastor Kent Harting officiating. Burial will be in Laketon Cemetery. Calling is 12:30 to 2 p.m. Monday, at the funeral home. Preferred memorials are the Laketon Cemetery or Ijamesville United Methodist Church.